The Jack Watkins Reserve is named after Jack Watkins who was the Asbestos and Toxic Waste Liaison Officer for the United Trades and Labour Council, and is a tribute to the workers who died from asbestos related illnesses. Jack Watkins was born in Manchester, England in 1935. He lived in a poor area where many people suffered and died from diphtheria, consumption and rheumatic fever due to unsanitary conditions and substandard housing. These experiences meant that Jack was always outspoken on the importance of living and working in safe, clean environments. 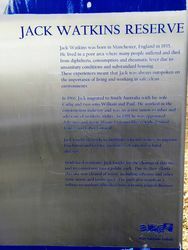 In 1966, Jack migrated to South Australia with his wife Cathy and two sons William and Paul. He worked in the construction industry and was an active union member and advocate of workers` rights. In 1988 he was appointed Asbestos and Toxic Waste Liaison Officer at the United Trades and Labour Council. Jack fought tirelessly to highlight asbestos issues, to improve legislation and to raise awareness of asbestos related diseases. 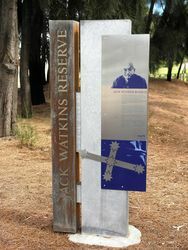 With local residents, Jack fought for the cleanup of this site and its conversion into a public park. Due to their efforts this site was cleared of waste including asbestos and other toxic waste and landscaped. The park also stands as a tribute to workers who died from asbestos related diseases.